This is a quick and easy craft that is sure to delight. All it takes to make this sweet carrot is some jelly beans, plastic wrap, and a few odds and ends. Add them to Easter baskets, use them as gift decorations, or give them as party favors. With just a little preparation by adult or team leaders, this is a great project for groups of kids. Cut the 12" square of plastic wrap, the 7" square of tissue paper, and the 10" to 12" length of curling ribbon. If you are doing this project with a group, pre-cut enough supplies for each project participant to make one or more carrots. Also, measure out jelly beans for each person, keeping in mind that each carrot will take about 1 ounce of jelly beans. Be sure to have enough carrots to use as forms in making the carrot shapes. Two or three people can share a carrot. Lay out the 12" square of plastic cling wrap and smooth out any big wrinkles. Place the carrot, tip in the middle and top at one corner, on the plastic wrap. Fold the plastic wrap over the carrot, bringing the corner opposite the top of the carrot up over the carrot to form a triangle with the carrot inside. Fold this triangle in half, with the carrot along one edge of the newly formed triangle. Roll up the carrot in the plastic wrap, securing the end with tape if needed. Gently pull the carrot out of the wrap. Fold the 7" square of tissue paper in half diagonally, then fold in half again. If you like, use decorative scissors to trim the loose corners of the tissue paper with a wavy cut. Fill the carrot shape with orange jelly beans to about 1" from the top. 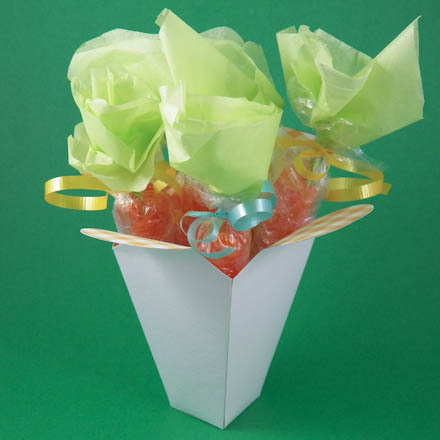 Insert the folded corner of the tissue paper into the top of the jelly beans. Twist the top of the plastic wrap, being sure to catch the tissue paper. Tie ribbon around the twisted top to keep the jelly beans inside and secure the top. 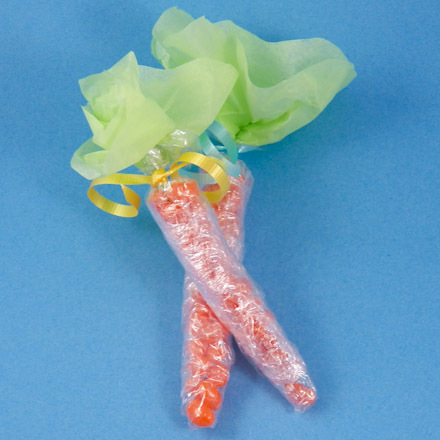 Fluff out the tissue paper to make it resemble a carrot top and curl the ends of the ribbon. That's it! You're done! Make as many jelly bean carrots as you like! Tip: The jelly bean carrots look terrific inside of a paper vase made using the pattern and instructions in Aunt Annie's Flared Box project. Thanks to Linda Parkins, an art docent who teaches 1st, 2nd and 4th graders, for sharing this craft idea with Aunt Annie's Craft Exchange back in 1996. Linda shares, "This project was easily accomplished by fourth graders, and was a lot of fun!!!"